Your LED patio umbrella is manufactured from strong and durable powder coated aluminum and steel components to withstand the harshest elements. The premium solution dyed polyester fabric is fade resistant and treated to inhibit mold and mildew growth. The canopy is simple to open and close using the easy to operate crank winder. The umbrella features a handy 2 position push button tilt mechanism to adjust the canopy angle with ease, providing superior all day UV protection for your family. 【APPLICATION】This umbrella for commercial and residential settings. Provide high UV radiation and keep cool in hot summer days, umbrella with easy to operate manual push up opening and closing system. 【MATERIAL】Polyester fabric cover, thick and not faded easily. 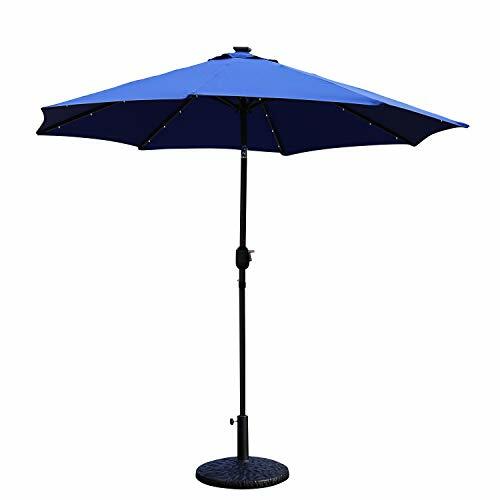 Made of waterproof polyester fabric with iron pole and ribs, easy to clean and provides 98% UV PROTECTION make this market umbrella a great buy. 【STORAGE】Crank system is easy to fold or open. This unique umbrella is ideal for freestanding use against the side of your home or patio area. Have cantilever operation to close the umbrella easily. 【FUNCTION】Have a solar panel at top to provide the glowing light, which can last almost 9 hours. The umbrella is not wind rated and must be CLOSED and SECURED in wind stronger than approx. 5 mph MAX. 【DIMENSIONS & NOTE】Overall height: 8.8 feet, Pole diameter: 1.5 inch. Note: Umbrella stand is NOT INCLUDED. To purchase a matching umbrella base search ASIN: B071F71DC4 or B071HSX15Y.